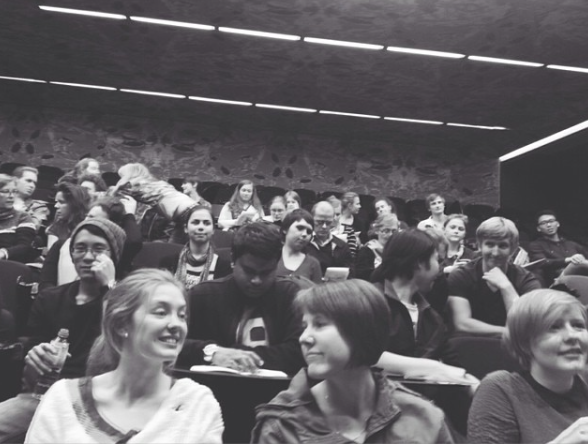 If you're a Uni student we'd love to invite you to our Unichurch congregation at UQ. Unichurch is for university students, high-schoolers, graduates and we even have some grand-parents! Everyone is welcome; you don’t need to be studying at Uni. If you have a car, there’s plenty of car parks on Sunday and it’s free. If you’re catching a bus, we’re an easy walk from either the UQ Lakes bus stop or UQ Chancellors Place bus stop. How do I get to the University of Queensland? If you have a car, there’s usually plenty of car parks on Sunday and it’s free. Best parking is on any of the streets close to our lecture theatre (Campbell Road, Blair Drive or a little further away on University Drive). If you’re catching a bus, we’re an easy walk from either the UQ Lakes bus stop or UQ Chancellors Place bus stop. Do I have to be a university student to come along? Everyone is welcome at Unichurch! Unichurch meets at the University of Queensland hence the name. We have a diverse group of people who come along. Some are in High School. Many are working. We even have some parents and grand-parents. We want people to understand who Jesus is as found in the Bible. That’s why each Sunday night we read the Bible and listen to someone explaining and applying it to our lives. The aim is understand God better and what he's done for us. We’re an Independent Evangelical Church. We have people who come from Baptist, Presbyterian, Anglican and other denominations, or even no particular denomination. Our songs are contemporary and are played by a band that consists of a mixture of guitar, keyboard, vocals, drum box or kit, bass guitar and sometimes a violin. The focus of the music is on what the lyrics teach us about Jesus. Kids are certainly welcome at Unichurch. It should be noted though that we are not able to offer a kids’ program or crèche. So bring your kids along if they’re happy sit alongside you in church. Yes. Each week we have dinner together after church for those keen to stick around. It's usually, Thai, Indian, Pizza or Red Rooster. We always have a vegetarian option. And we try to get some gluten free options too. We ask people to donate something to help cover the costs. Around $5. When Uni is on we have around 90 to 100 people. During Uni holidays there's usually between 60 to 70. It feels like there’s more than enough people to get to know but not so many that you’ll get lost in the crowd.